Do American Jews agree on anything anymore? It seems like they have been asking the question for years — or at least since 2016. And in the campaign leading up to the 2018 midterm elections, divisions have become even more pronounced. Whether there’s a “blue wave” when the day is over or Republicans hang on to their majorities, 2018 will have left the impression in the American Jewish community that the political center appears to be disappearing. Polls show that most American Jews support liberal policies and will vote for Democrats. But both parties have become sources of unease in some corners of the Jewish community, with many of 2016’s internal Jewish debates again being litigated. The closing days of the campaign saw a string of Republican candidates put out material echoing classic anti-Semitic tropes about a conspiracy of greedy Jews. And Republicans have increasingly aimed their rhetorical fire at George Soros, the liberal Jewish financier, in ways that for many echo classic anti-Semitic themes of a secretive minority asserting global control. Earlier in the year, a string of Democratic candidates won primaries despite their willingness to criticize Israel in a way once considered unthinkable for a major party. Those tensions have become compounded as Israel’s right-wing government bear-hugs President Donald Trump while most American Jews continue to disapprove of him. Here are four takeaways on how the midterms affected American Jews. Is the old anti-Semitism new again? Pro-Israel activists often argue that anti-Zionism is the new anti-Semitism. But this campaign season shown us that the old anti-Semitic rhetoric is still very much around. Republicans increasingly highlighted Soros as an enemy as Election Day neared. President Trump has suggested, without evidence, that the Jewish billionaire is behind the migrant caravan making its way to the U.S. border. The Republican Party has also put out a number of ads attacking Soros, including one in which he is shown alongside a pile of money. An extremist from Florida is accused of sending a pipe bomb to his house last month. 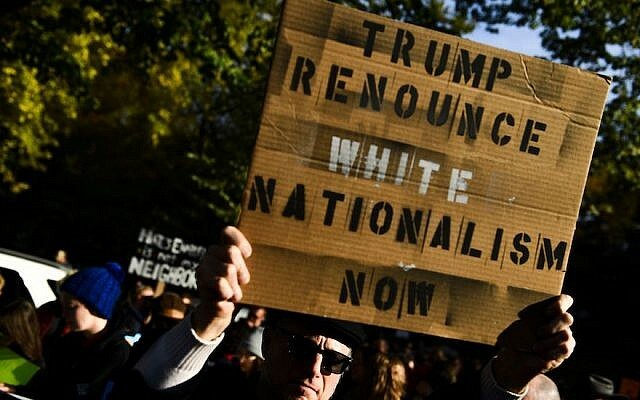 Critics have called out the GOP for echoing old anti-Semitic stereotypes about a Jewish financial conspiracy to control the world and a newish version that says Jews are seeking to “replace” white citizens by supporting the immigration of people of color. The Republican National Campaign Committee has denied that its ads are anti-Semitic and says it is targeting a leading liberal donor. The middle ground says even if your intentions are innocent, why promote a campaign theme that is so enthusiastically embraced by the white supremacists? And in recent days, even after the Pittsburgh synagogue shooting killed 11 worshippers, candidates — Republican and otherwise — have trotted out material with anti-Semitic tropes. That’s aside from the several candidates who are avowed neo-Nazis (having snuck in, to their party’s dismay and opprobrium, in uncontested districts) and Iowa Rep. Steve King, who has repeated white nationalist rhetoric (and thereby lost the support of the National Republican Congressional Committee). The Washington Post reported Tuesday that Republicans in five states have run ads showing Jewish Democrats handling cash. Republicans have also been trying to connect the Democratic Party to Nation of Islam leader Louis Farrakhan, who popped back into the national consciousness recently by comparing Jews to termites, sharing a stage with former president Bill Clinton at Aretha Franklin’s funeral and leading a “Death to America” chant Sunday during a solidarity trip to Iran. Donald Trump Jr. tweeted, “When will the democrats disavow this guy?” Rabbi Shmuley Boteach, of the World Values Network, also called on Clinton, former president Barack Obama and U.S. Sen. Cory Booker, D-N.J., to condemn him. Democrats and Israel is a never-ending saga. Not that opposition to Israel is gone. For Democrats and the Jews, the true drama came earlier this year when a crop of upstart progressives won the party’s nomination for Congress, in some cases unseating Democratic stalwarts. Those candidates’ statements and records, plus poll numbers, mean that the party may not be as reflexively pro-Israel as it once was. Several candidates, mostly expected to win, sparked the concern of pro-Israel Democrats. Alexandria Ocasio-Cortez, who scored a major upset in her New York City district, is a 28-year-old progressive in the mold of Vermont Sen. Bernie Sanders, an Independent who caucuses with Democrats. Israel was by no means at the center of her campaign, which focused on representing her working-class district. But she once called Israel’s clashes with protesters in Gaza a “massacre” and criticized Israel for its West Bank occupation. Pro-Israel Democrats have said that these figures are outliers in a generally pro-Israel party. But Sanders, who leads the party’s progressive wing, released three videos sharply critical of Israel in March — though he has vocally opposed the movement to boycott Israel and has called himself “100 percent pro-Israel.” And poll numbers show the party drifting from blanket support for Israel. A Pew survey from January showed that the share of liberal Democrats who sympathize more with Israel than the Palestinians has declined to 19 percent since 2016 from 48 percent in 2001. And while moderate and conservative Democrats continue to sympathize more with Israel than the Palestinians, that support has declined 18 percentage points since 2016. Liberal Jewish leaders have argued that one can be pro-Israel and still support an end to Israeli control of the West Bank. But the traditional pro-Israel position has usually deferred to the Israeli government — currently its most right wing in history. The divide between the parties has filtered so deeply into the Jewish community that it remained an issue even at a moment that may have otherwise been unifying. Following the Oct. 27 massacre in Pittsburgh, Jewish communities across the country (and world) mourned together and expressed solidarity. But the unity seemed to end there. Questions of who was to blame for inciting the murderer, and what should be done to prevent future anti-Semitic attacks, immediately divided American Jews. On the day of the tragedy, Trump said that having an armed guard at the synagogue could have prevented the attack. Some Jews agreed with the president, and this past Shabbat, a week after the shooting, security was beefed up at U.S. synagogues. But others in the Jewish community, which is largely pro-gun control, expressed unease with the idea of having armed guards at their places of prayer. The argument touched on a deeper lack of consensus among Jews. While non-Orthodox Jews tend to hold liberal opinions on a range of issues, a minority of Jewish conservatives, especially among Orthodox Jews, has taken to defending gun ownership. The more charged argument following Pittsburgh was over what role, if any, Trump played in encouraging the attack. Although the alleged gunman, Robert Bowers, was critical of Trump, he vilified the Jewish refugee aid group HIAS shortly before his shooting spree at Tree of Life following a period in which Trump had spread fear of a migrant caravan heading to the Southern border. More generally, Trump has made a clampdown on refugee admissions a center of his ideology, and white supremacists have felt emboldened, justifiably or not, by his rhetoric. When Trump visited Pittsburgh following the massacre, a group of protesters turned their backs on him as his motorcade passed. Among his most enthusiastic greeters in Pittsburgh, however, was the Israeli ambassador to the United States, Ron Dermer. Some observers thought it was bad protocol for an Israeli envoy to inject himself into American politics, especially in the week before the election. “For Ron Dermer to respond to Pittsburgh with an extreme form of both-sidism, not recognizing that anti-Semitism is rising on one side, was maddening to me,” New Yorker staff writer Adam Davidson wrote. The split between Israeli and American Jewish views of Trump is a microcosm of the deeper divisions among Jews as the midterms draw to a close. 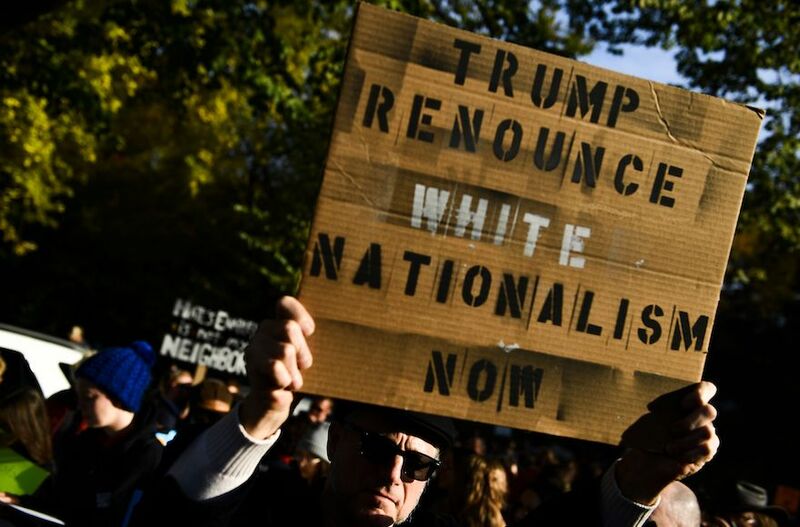 Which is more concerning: white nationalism or the BDS movement? Is Trump inciting bigotry, including against Jews, or is he the “best friend” Israel has ever had? What should be the community’s policy focus, especially following a tragedy? Centrist groups like the Anti-Defamation League insist that the community can do many things at once: monitor and fight both anti-Semitism on the right and the effort to delegitimize Israel on the left, for example, or thank the president for defending Israel while criticizing his domestic policies. But in a polarized era, on these and other issues, Jews appear to be taking sides.